Bolognese Sauce, also known in Italian as ragù alla bolognese. 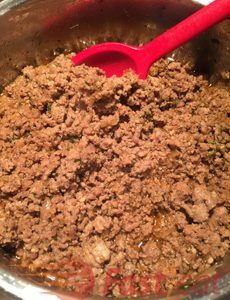 The Classic Italian Bolognese meat sauce is made with ground beef, pork, and Italian sausage, I just use ground beef as my daughter doesn’t like pork and Italian sausage. But you can add them if you and your family like. Use it with any pasta, from spaghetti to lasagna, whole wheat, white or gluten-free, or try this Bolognese Sauce with a low-carb, healthier alternative to pasta using Spaghetti squash! It’s still amazingly delicious with half the calories! Spaghetti squash is a favorite ingredient for those seeking a lower-carb, paleo-friendly, clean eating, gluten-free alternative to pasta. Crispy fish without the grease – Haddock (or other white fish) is lightly breaded and baked. Parmesan adds a nice flavour. So much flavor… so easy, healthy and tasty! Ideal for busy weeknights. It’s a “cheesy” variation from this “lemony” Oven-Baked Lemon Fish Fillets Fast2eat. Did you know you don’t have to spend time peeling and cutting potatoes to enjoy a delicious hot bowl of creamy Kale potato soup (AKA Caldo Verde)? Caldo Verde, a potato and kale soup from Portugal, is a go-to recipe when the weather gets cold outside or for lazy rainy days, when you want something hearty and comforting but don’t feel like putting in a ton of effort. It’s made with a few simple ingredients, it takes all of maybe 10 minutes of prep work, and it’s ready to eat just less half an hour later. Oh, and it’s all made in a single pot, too. And did I mention delicious? It’s really delicious. This is one of the best spinach dishes I’ve tasted. This super easy creamy spinach soufflé is a treasured recipe from my childhood. Actually, it was my childhood favorite. My mom’s version was made with eggs (egg yolks and beaten egg whites to give volume), but I’ve updated the recipe to make it faster and easier. Surprisingly, my vegetable-avoiding son loves this spinach soufflé. This one and this Carrot soufflé are the only veggies that he eats. I have a feeling this spinach soufflé will become one of your family favorites, too. Plus it’s clean eating, gluten-free, and easily converted to be vegan. The secret to the most intense flavour is the leek. A dollop of cream, nutmeg and frizzled sage and coriander leaves complete this wintertime classic. This recipe was adapted from the one my friend Gosia has sent to me. This is SOOOOOO good… absolutely delicious! And not only is it a flavor bomb, you won’t believe how easy this beautiful dish is to make, all in one pan!!! It requires just 5-minutes (or less) prep with only 4 ingredients and rich, delicious flavors! An easy one pot dish, healthy, simple, and gluten-free dinner recipe. It is freezable and can easily be prepped ahead (as in make all the meals on the weekend and then stick them in the oven throughout the week). If you’re a beginner, or just want something tasty and easy to cook, you should definitely give this a go! This is an authentic Brazilian ground beef recipe. Among everything, we must learn how to make in order to survive it is the ground beef! It’s fast, not expensive, and very, very easy to make. It’s the basics of basics in the kitchen. As a filling of the Brazilian Blender Pie Fast2eat or Shepherd’s Pie. As a topping of the 15 minutes Baked Potato Fast2eat. Or just covered with cream cheese (or any cheese) in a casserole. And also accompanied by any Salad and/or Brazilian Style Rice Fast2eat. A hint of sweetness from the Dried Cranberries with the crunchy of the Sliced Almonds and the deep, nutty flavor with a slight crunch of the Poppy Seed will bring this creamy coleslaw lots of flavour. Coleslaw is always on the bottom rung of most people dish desires. But this has turned out not to be the case, this creamy coleslaw recipe always, gets not just one, but several big, Big, BIG thumbs up from everyone. You’ll have to try it for yourself to believe me.